Excepting very tiny animals, all flying species produce more lift than drag (usually by many times), and use lift for weight support and thrust. To produce substantial lift, a wing must be held at some effective angle of attack to the oncoming flow. Angle of attack is the angle between the chord and the direction of travel. Note that effective angle of attack is different from the raw angle of attack – the effective angle of attack also includes the effect of camber, which is curvature in the wing along the chord. A cambered wing has a positive effective angle of attack even if the raw angle of attack is zero (Pennycuick, 1989; 2008): camber adds to the effective angle of attack. There are multiple methods for modeling the production of lift, but most engineers now favor the use of a vortex model. 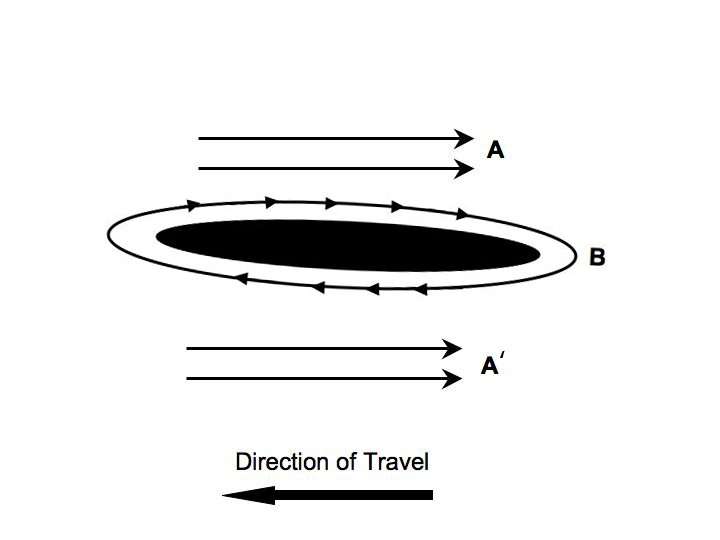 A vortex model works on the observation that a lift-producing foil has two mathematical components to the flow about the foil: a translational component and a circulation component (See image at left). The circulation is a component only; no fluid actually travels around the wing in a full loop, but there is a component of the overall flow that can be represented as a “bound vortex”: fluid rotating on the wing itself. The image at left is a quick schematic I put together that shows flow components of a wing. The translational flow is indicated by A and A’ (above and below the wing, respectively). The label B indicates the circulation component. When the wing is at a positive angle of attack, circulation is present on the wing. The sum of B and A is then greater than the sum of B and A’ (note that the direction of B and A’ are opposite), such that flow above the wing is faster than that below it. This results in shed vortices: rotational elements of fluid pushed along behind the wings that balance the angular momentum of the vortices on the wings. It is the circulation that producing asymmetrical flow: the circulation adds to the velocity of the air above the wing while it simultaneously reduces the net velocity of the flow below the wing (Alexander, 2002; Vogel 2003; Pennycuick, 2008). This produces a differential pressure that pushes upwards on the wing. The same process can be viewed in terms of momentum: the circulation about the wing means that air coming off of the wing is deflected (generally downwards and backwards, for a horizontally flying animal), and this added momentum means that force is being exerted on the air, which pushes back on the foil (in accordance with classic mechanics, specifically the Third Law of Motion). The rate of momentum transfer is equal to the total fluid force (Vogel, 2003). The lift produced by a wing can therefore be examined in terms of vorticity: the strength of the circulation on the wing and the shape and strength of the vortices that swirl behind a flying animal (or machine). These shed vortices are collectively called a “vortex wake”. One method of distinguishing modes of flapping flight is through the differences in the trailing vortices, which indicate differences in how momentum is added to the incoming flow. "there is a component of the overall flow that can be represented as a 'bound vortex': fluid rotating on the wing itself. "—What is this? It's a mathematical component of how the air moves around a wing. The best way to calculate it is to break the problem into two parts. The first part is translational: air moving front to back. The second part is the circulation, which is air swirling on the wing (see figure). Now, no air actually goes all the way around the wing. It's just a mathematical component that does not exist alone. But, because of that part of the overall air motion, the air behind the wing does spin (in the opposite direction). Spinning fluid is called a vortex. My question is, what is "the circulation, which is air swirling on the wing". Air swirling on the wing? I see B in the figure. I just have no idea what that is supposed to be. Why does air swirl on the wing? Is air somehow caused to move in the direction of travel along the underside of a wing? Air is forced to rotate on the wing, so it's being pulled along towards the direction of travel below the wing and away from direction of travel above. To understand why the air rotates, imagine that I have a cylinder with air flowing around it. The air goes around both sides equally. Nice and clean, no lift. Now, I create an asymmetry. For example, I spin the cylinder. Because a bit of the air sticks to the cylinder, this will pull the air around and create uneven flow. I'm making it spin with the cylinder. This results in lift. You can create the asymmetry by using shape instead of spinning the cylinder. If I deform the cylinder section so it's angled and has a sharp trailing edge it creates an unevenness just like when I spun the cylinder. Lift is produced again. Thanks!! 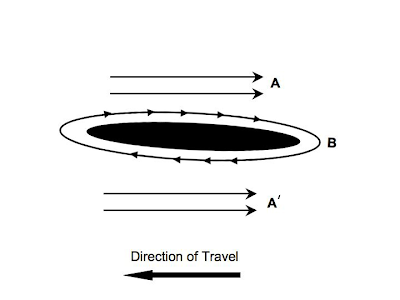 In the cylinder example, the cylinder is spinning, so it is easy to see how the tiny bit of air that sticks to the cylinder might go in the direction of travel—the "wing" surface itself is moving in that direction and dragging the air along. But when the asymmetry is created by shape rather than spin, there is no such movement in the direction of travel. The best I can imagine is that the tiny bit of air under the wing might be stopped or going much slower, but travelling in the direction of travel? I don't see why it would be doing that. Well, in the end, the tiny bit of air under the wing is just going much slower - none of it actually reverses and goes in the direction of travel (it doesn't with the cylinder, either, if the cylinder is also moving forward fast enough). However, the *tendency* to spin in that direction can be extracted mathematically, and gives the exact amount by which the air is slower beneath the wing. Here's a trick at home that you can use to help visualize why the air "tries" to spin on the wing. Draw a circle, then draw a horizontal line through it, and mark the two intersection points. Now, imagine that circle is the cylinder cross-section from before. If it's not spinning, then the air splits and goes around evenly. It splits at the first dot you marked and tend to come together at the second one. Those are called stagnation points: little bits of air have no speed at each of those points. Now, if the cylinder spins, the points move. As the air comes in, it gets spun around the cylinder. Re-draw the backside stagnation point lower along the radius of the circle, so it's closer to the first one along one arc (below) and further along another (top). The air is whipping around the longer distance between the stagnation points on top, and moving more slowly between them on the bottom. Now, on an airfoil cross-section there is also a stagnation point asymmetry. At a positive angle of attack, the air hits a bit underneath the wing, then splits and either takes the route up and over (longer) or underneath (shorter). The sharp trailing edge of the wing forces the rear stagnation point to be at the tip of the cross section, so now the two stagnation points are closer on one side than the other again, just like the cylinder. This does exactly the same thing (producing a spin component) even though it doesn't seem as intuitive. The proper way to do this is with a complex number space transformation - you take the vector field on the circle and write and equation to stretch it into the vector field on the airfoil. That equation becomes the basis for calculating the circulation component of the overall flow on the airfoil, which gives the magnitude of lift.